Steven S. Schneiderman’s “Marshlanders” is an enjoyable, wholesome read. In his adventure suspense novel “Marshlanders” (published by AuthorHouse), author Steven S. Schneiderman offers readers an enjoyable mystery adventure set in Chicago and points south of there. 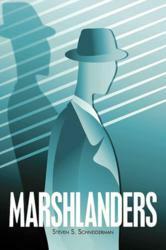 In “Marshlanders” Schneiderman returns to his doddering protagonist Louie Leppedimay and Leppedimay’s cohort of attractive assistants to solve a murder mystery. “The inert body was ballasted with four bowling balls; eye-pikes drilled in the sides; roped together, rolling stock and former person. A flat wind-skimmer boat conveyed body and brief associates into backwater swampage. It was consigned to the mud in a side channel; in a hole where the boat driver knew alligators generally frolicked. Steven S. Schneiderman has been a professional engineer since 1977. He has degrees in mechanical engineering, environmental engineering and a doctorate in molecular sciences. He has been associate professor at Murray State University since 1989. Schneiderman specializes in technical education, environmental engineering, industrial energy management, regulatory affairs and liberal arts. He is also the author of “Lakelanders" and “Wastelanders,” also available from AuthorHouse.